One of the most powerful factors in the evolution of cities, and one of the most interesting topics of the day, is rapid transit. It affects not only the health and comfort of all citizens, but the very existence and prosperity of cities themselves. Although much has been written about it, the last word has not been said. Modern inventions do not change human nature, but they do change human affairs. When the Lord put it into the mind of someone "to pave the roads with iron bars" -as Emerson hath it- a new epoch began, that of the railway system, which, although but sixty years old, has changed the face of the world. Rapid transit in cities was born about the same time, when, in 1834, John Stephenson, of New York, invented the horse-car to run on tramways, or flat rails, laid in the streets of our cities. For this his name is worthy to be placed beside that other Stephenson, who found the locomotive a toy and left it a perfect machine. We are now just beginning to see the far-reaching effects of this simple invention. It has solved the problem of city life. It is fast abolishing the horrors of the crowded tenement. It is shortening the hours of labor. It makes the poor man a land-holder. It is doing more to put down socialism, in this country at least, than all other things combined. One of its effects is giving great trouble. The better the service of street railways, the faster does the city population grow, the more do the people ride, and the greater is the congestion of traffic, and the louder the complaints of the public. The demand for rapid transit facilities increases faster than the supply. Everybody thinks that their own city is in the worst plight, and the managers of their street railways are the meanest men on the face of the earth ; but it is an interesting fact, and one which has suggested these articles, that all large cities, where time is of any value, are now in like distress. Street lines, subways, elevated railways, and other means of conveyance, have so greatly increased the population of cities, by making the outlying districts available and accessible, that they cannot carry the people who want to ride. This is not only the case in the greater American cities, but also in Vienna, Berlin, Paris, London, Liverpool, Glasgow, etc. A comparative study of the conditions which have brought about this congestion of traffic may suggest a remedy. In the present article we shall discuss the problem; in the second, the solution. The conflict between city people and those who live in the country is as old as history. There always has been an influx from without to within. So long as the area of cities was limited, this was strongly and successfully resisted by the citizens. They felt themselves a superior class to the rustics. The very words "urbane" and "rustic" tell the story. 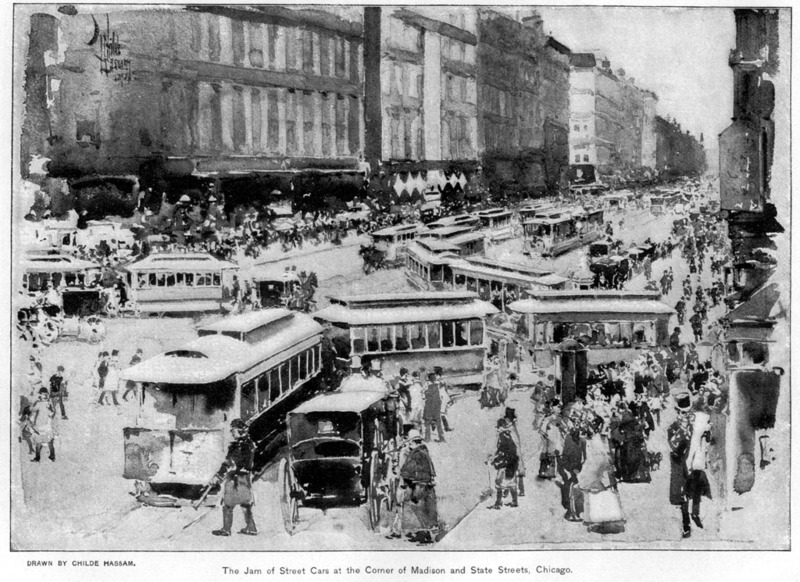 Jam of Street Cars at the Corner of Madison and State Streets, Chicago. Drawn by Childe Hassam. The Romans called the outside dwellers "villmi;" from which come two words, one of honorable significance, "villa," and the other, perhaps a little modified by medieval use, "villain." Roman citizens looked down upon the country folk as an average New Yorker does upon a stray Jerseyman from the pines. All literature has been tinged by this feeling, and both writers and statesmen have continued to deplore the excessive growth of cities as a national evil, and have exhorted countrymen to stay at home, telling them how much better off they were in the country. Observation has now taught us that this growth of cities is a necessary part of the evolution of our social structure, and that it is not a growth at the expense of the country, but for the benefit of the country, as well as that of the city. Recent statistical inquiries have shown that cities grow because they absorb the beak and not the worst, of the rural population, who better their condition by coming to town. Charles Booth, the eminent English statistician, in his great work, "Labor and Life of the People," has shown, from very extended inquiry, that most of those who come to London from the country either have work already engaged, or have good prospects of getting work; and that their condition is generally improved by their change of abode. The British Census of 1890 confirms this in a striking manner by showing that the people of country birth are most numerous in the wealthy quarters of the city, where employment abounds, and least numerous in the poverty-stricken quarters. All this is contrary to the preconceived opinion that countrymen wander aimlessly to the city, and are chiefly tramps, or broken-down persons. "Hark! the dogs do bark, The beggars are coming to town." This is not so. The emigrants from the country to the city, with exceptions, of course, are the bone and sinew of the rural population, the most energetic and the best. They come to better themselves, and they do better themselves. This is just as true, and probably more so, of the United States as of England. The significance of it is that the growth of cities will never stop so long as means are given to bring people to them, and to enable people to get about over their ever-increasing areas, without too much loss of time, which is money. Railways- "the paving of the roads with iron bars"- enable people of moderate means to travel to the cities, and rapid transit facilities enable them to use the cities when they get there. Hence our cities have grown equally with our railways, and almost directly as their mileage. 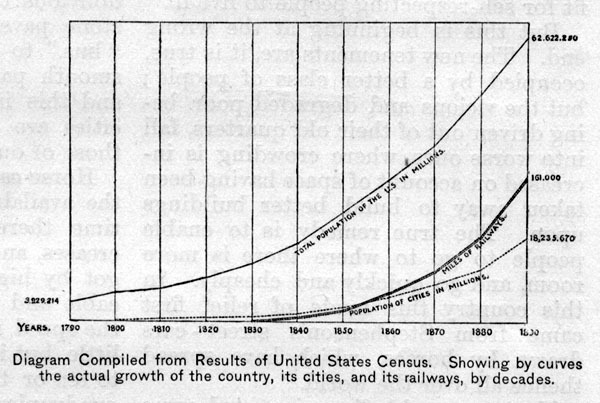 This can be clearly seen from the above diagram, compiled from the results of the United States Census, It shows by curves the actual growth of the whole country, of its cities, and of its railways during equal periods of time. It does not show what is still more remarkable, the relative growth of cities to that of the whole. In 1790, the total city population was 3.35 per cent. of the whole. One hundred years after, it is 29.12 per cent. The mileage of steam railways has increased from 23 miles in 1830, to 161,000 miles in 1890; and the mileage of steel railways,from nothing in 1834, to 10,500 miles in 1890-91. It seems to be evident that there is no limit to the growth of cities, except the difficulty of getting about in them. There are two ways of solving this problem: One is to build very lofty buildings, and crowd many families under one roof. The other is to take people quickly to and from the outlying districts by rapid transit. The cities of sixty years ago were of such small area that people could walk to and from their daily work without much loss of time. Nobody seemed to be in a hurry in those days, and life went on very easily and smoothly. As population increased the poorer classes crowded into tenements, so as to be near their daily work. These tenements were generally old buildings, whose rooms were cut up into smaller ones. They lacked light and air, and had no sanitary conveniences. Philanthropists spent much money in trying to improve these buildings and make them fit for self-respecting people to live in. But this is beginning at the wrong end. The new tenements are, it is true, occupied by a better class of people; but the vicious and degraded poor, being driven out of their old quarters, fall into worse ones, where crowding is increased on account of space having been taken away to build better buildings upon. The true remedy is to enable people to go to where there is more room, and go quickly and cheaply. In this country this mode of relief first came from Stephenson's street-cars drawn by horses, which have spread thence all over the world. Next came cable-lines, invented some twenty years since in San Francisco, to overcome the steep grades of their streets, by A. S. Hallidie, whose name has not received the credit which this very important improvement deserves. The latest and greatest invention is the electric trolley system. This is so simple, inexpensive, reliable, and safe, that it has "come to stay," in spite of the opposition of those conservatives, who are the sons and grandsons of those older conservatives who bitterly opposed horse-railways, but who fortunately failed to prevent their adoption. The locomotive, the horse of the people, was opposed, and the street-car, the carriage of the people, was opposed; but that which is for the greatest good of the greatest number will always conquer in the end. While it may be admitted that overhead trolley wires are unsightly, and not well suited to the closely built up parts of cities, there can be no objection to them in the outlying districts. Their economy is their chief merit, as this makes the system a flexible one, which can be extended to meet the wants of the public much faster than any conduit system, either for electric wires, or for cables. 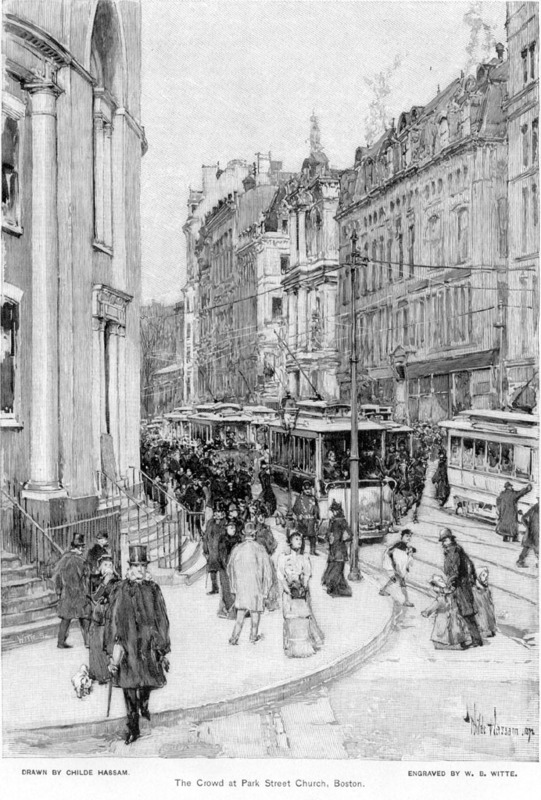 European cities, while employing surface tramway cars drawn by horses, and subways, both steam and electric, rely largely for getting about upon the omnibus. As a means of rapid transit this is inferior to the street-car, but the fact that the latter glides along on its smooth pavement of iron bars, makes the public oblivious of the wretched state of the stone pavements on either side. The "bus," to get any speed, must have a smooth pavement all over the street, and this is one reason why European cities are so much better paved than those of our country. Horse-cars rather more than double the available area of a city, and for a time there is relief. Population increases, and a wider area can only be got by higher speed. Then come the cable and electric cars, which increase the speed in the congested streets very little, but in the outer districts from six to ten or twelve miles per hour. This quadruples the original city area, without taking any more of the people's time in riding. It may be truly said that all the efforts of trades-unions, assisted by legislation, to shorten the hours of labor, have not accomplished so much as the simple device of "paving the roads with iron bars." After a while the ever-increasing traffic puts an end to this relief, and the only thing to be done in the congested parts of the city is to go above ground on elevated railways, or below ground in subways. But, as we see to-day in New York, and in London and other European cities, this relief does not last, unless the number of these lines is constantly increased. We win illustrate it in detail the experience of these and other cities. 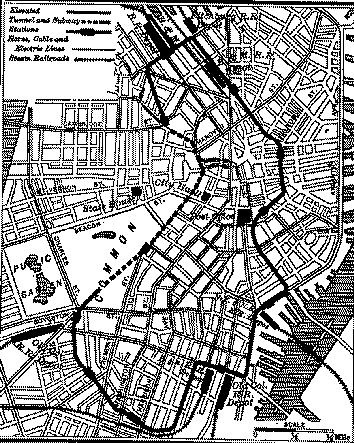 Maps of Berlin, Paris, London, and Boston, covering in each case an area five miles wide, by eight miles long, appear in this article; and in the second article there will be maps of New York and Chicago, covering ten miles wide by sixteen miles long. The distribution of the population is such that the census numbers of these cities correspond nearly with the areas, except in the case of Boston, whose population would be largely increased if the whole amount included in the area of the map were included. The space occupied by New York is so much encroached upon by water, that the area for future growth of population lies even beyond the limits of the map. If the whole area of Chicago were as thickly populated as the central parts of that city, its population would exceed that of New York. From all of these maps one can see what is meant by the congested districts, and where the outer and as yet thinly populated districts lie, access to which can be given by rapid transit facilities. We have given no map of Vienna, because it has no rapid transit, and only refer to it to show the great cost of modernizing an ancient city. It is proposed to build an outer belt-line connecting the railway stations for through passengers and freight; then an inner belt for local traffic, also two radial lines dividing the inner circle into quadrants for local, traffic. These lines, together with some new sewage works, and works for the control of the river, and a winter harbor, are estimated to cost $85,000,000, which will be divided between the city, the province of Lower Austria, and the Empire. Here the whole burden of the rapid transit is to be assumed by the community, and private capital is called upon only to purchase bonds. 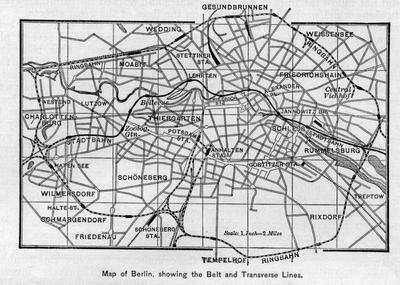 The city of Berlin, the modern capital of the German Empire, with a population of over one million three hundred thousand, is now probably better supplied with facilities for rapid transit than any other European city, but more are wanted, and are now about to be built. The topography of this city offers excellent facilities. Berlin lies on a level plain and can be extended in all directions. The little river Spree is too small to stand in the way of the necessary works. What a different state of things this is from that of New York, where it was once proposed to fill up the East River, and where it is now seriously proposed to fill up the Harlem River! 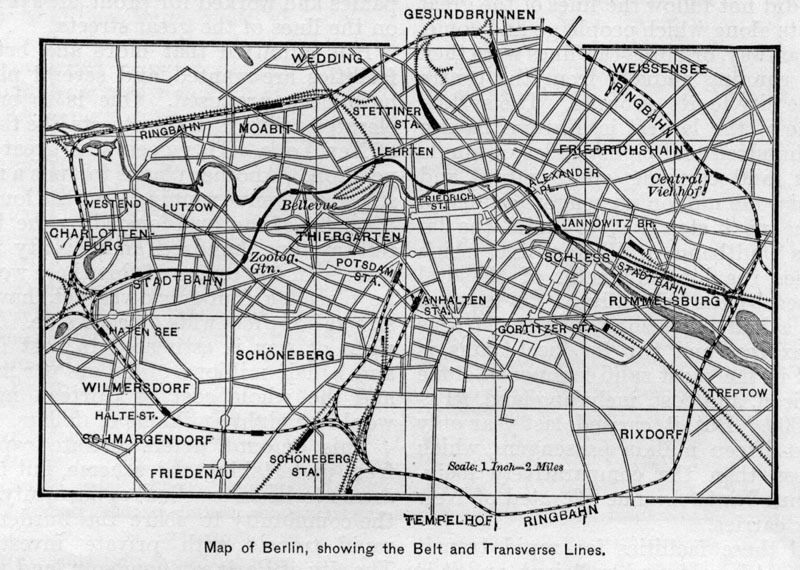 The first step that was taken in Berlin was to connect the outlying railway stations by a Ringbahn, or belt-line. While this was very useful for transferring freight, it carried but few passengers, as it did not follow the lines of the great streets along which people go and come. Tramway, or horse-car, lines were then laid, running radially from the centre of the city to its suburbs. The system is one of the largest in Europe, having one hundred and eighty miles of single track, and carrying one hundred and twenty-one million passengers annually. The next step was to build the famous Stadtbabn, or Viaduct line, which crosses the long diameter of the oval formed by the belt railway. It is seven and a half miles long, has two tracks for express and two for local trains, is built in the most solid manner of stone and iron, and cost, including land, $16,000,000. But it carried last year only about fifteen million passengers, which is less than the comparatively insignificant Ninth Avenue Elevated of New York carries. All these facilities for rapid transit have not been found sufficient, and it is now proposed to again divide the oval area, to which everybody wishes to go, by two lines of subways crossing each other at right angles. These quadrants will also be traversed by two small belts, dividing the greater oval into three divisions. All of these lines will be laid out under the principal thoroughfares. They will consist of two small iron tubes like Greathead's South London Subway, having elevators capable of carrying forty or fifty passengers, which will be placed at the stations. Berlin is an illustration of the never-ending demands of rapid transit. Better facilities increase travel, and then more facilities are wanted, and so on, ad infinitum, so far as we can now see. The city of Paris, with a population of about two million two hundred thousand, is in the first stage of rapid transit. She has a ceinture or belt railway connecting the principal railway terminal stations, but like the outer belt of Berlin, it handles freight chiefly, and but few passengers. Tramway cars, omnibuses, and cabs give other means of rapid transit. The poorest people walk, and those who are a little better off ride in tramway-cars and omnibuses. These being owned by commercial companies and worked for profit, always run on the lines of the great streets. It is admitted that more and better facilities are wanted, and several plans have been proposed. One is to build elevated railways in the streets like those of New York. This meets with great opposition. Another plan is to open a new street or avenue running near the longer diameter of the oval formed by the belt railway, one hundred and seventy feet wide. In the centre of this there would be placed a four-track viaduct, having streets sixty feet wide on each side. The right of way is estimated to cost four and a half millions of dollars per mile, and the whole cost of thirteen miles would be eighty millions of dollars. This amount deters private capital from undertaking the scheme, but here seems to be an excellent opportunity for the community to share the burden of rapid transit with private investors. The city of Paris can condemn land wider than that necessary for this scheme, and sell it at a profit sufficient to repay a large part of the cost, as was done in the case of the new boulevards built by Haussman in the time of the Empire, and of the Avenue de l'Opera, since. Some electric subways on the Greathead system are also proposed. They will be very small, only eighteen feet in diameter, to carry two lines of rails, and will be worked by electric power. They are intended to run from the Arc de Triomphe along the Champs-Elysees, the rue de Rivoli, with a return loop along the grand boulevards; that is to say, they coincide with the lines of greatest traffic. Their depth will not require elevators, and it is estimated that they will cost but eleven millions of dollars, which seems a very insufficient sum. Even were it doubled or trebled, it would be less than half of a viaduct line of the same length. This is one advantage of the subway system if made of these small round tubes. Another very great advantage is that the subway system can always follow the lines of the great thoroughfares, without destroying valuable property. 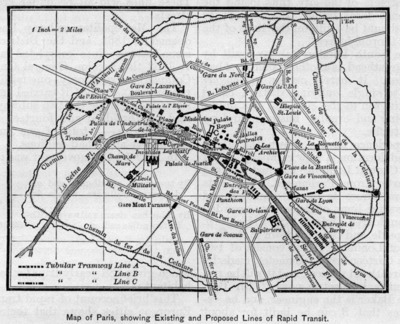 Another plan of rapid transit is proposed by the eminent engineer, Eiffel, which differs from any others in proposing to construct a line partly in subways and partly on viaducts, the two being united by inclined planes. Map of Paris, showing Existing and Proposed Lines of Rapid Transit. This line is a little less than seven miles long, and runs around and through the heart of Paris, where the circulation of people is greatest. It runs from the Church of the Madeleine along the Grand Boulevard to the Southern Railway station, then crosses the Seine to the Orleans station, recrosses near the Hotel de Ville, and runs under the rue de Rivoli to the place of beginning. It is proposed to operate it by locomotives that consume their own smoke. About one-third is above ground and two-thirds in subway. The cost is estimated at $15,000,000, and the yearly traffic at forty-five millions of passengers. 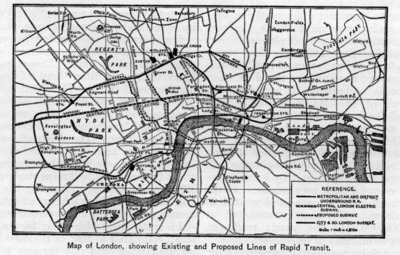 Rapid transit in London began as elsewhere, with a belt connecting its principal terminal stations. These are the famous "Metropolitan" and "District" underground lines. The Metropolitan lies near and parallel with the river Thames, and fortunately near one of the great lines of traffic between London and the West End. The District follows the northern line of the oval belt, and still farther north is another line called the "Outer Circle." Trains run around all these belt lines, connecting the railway stations, and branching out into the country radially in many directions. In spite of all this their business is small compared to that of the New York elevated lines, and not enough to pay interest on the investment. The travel is very small considering the great population of London. The reason of this was explained by the general manager of these lines to the Boston Rapid Transit commissioner, Mr. Fitzgerald, in 1891. Said he, "We labor under the disadvantage of having our stations too far removed from the business streets of the city, thus losing the immense local traffic. Such roads as ours should be built on the lines of the great thoroughfares." 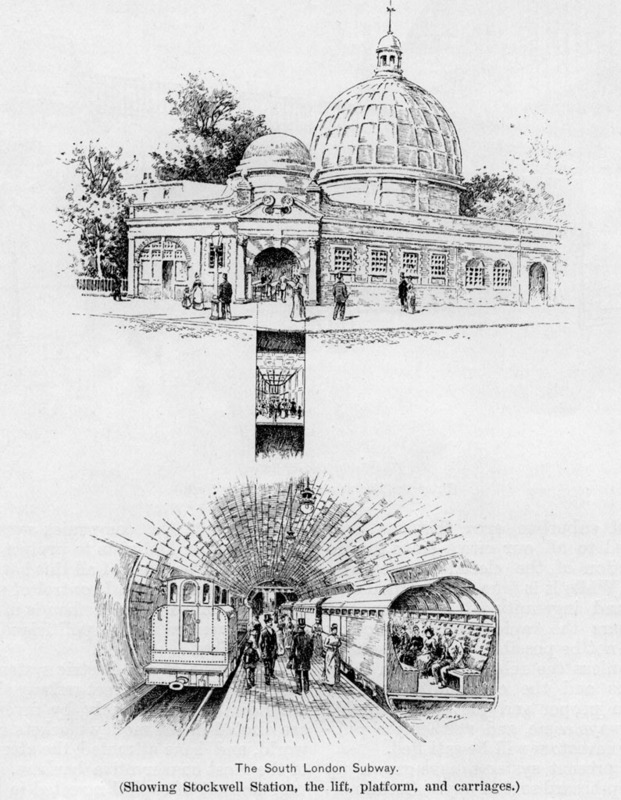 The South London Subway, built by Mr. Greathead, is another example of bad location. It merely carries passengers from a single outlying district called Kennington to the city, and has only a morning and evening business, and no local traffic. Experience having shown the effects of bad location, a new company, called the "Central London," has just received a charter from Parliament. This cuts the oval across its longer diameter, and follows the lines of those very crowded thoroughfares, Oxford Street, Holborn, Cheapside, and Cornhill down to the East End of London. It will consist of two tubes thirteen feet in diameter, made by the Greathead process, and it will be run as that is, by electric power. Sir Benjamin Baker is the engineer, and he estimates that it can be built for about two million dollars per mile, and that it will carry fifty-two millions of passengers soon after opening for traffic. 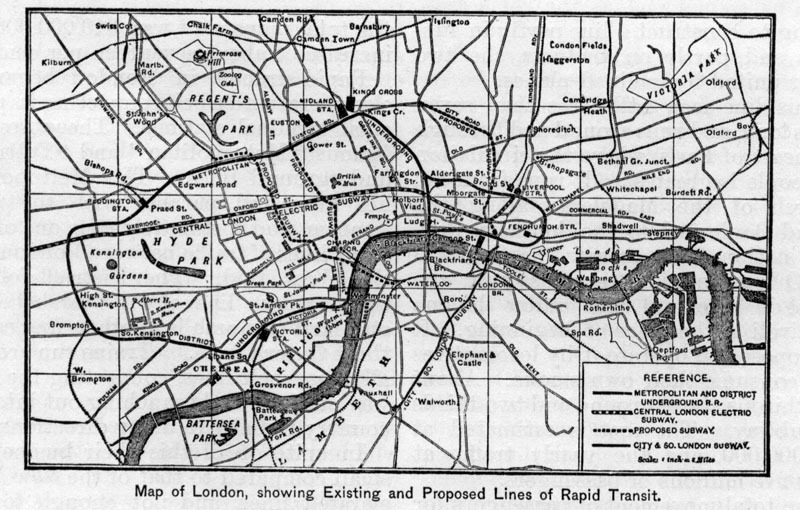 Map of London, showing Existing and Proposed Lines of Rapid Transit. Besides this there are other electric lines of a similar character proposed to run across the short diameter of the oval, and connect the great railway stations on the north of London with those on the south by direct lines, instead of running a long distance around. These lines will all be under crowded streets. which gives 186 yearly trips for each inhabitant. This brief account of rapid transit in European cities shows that their experience has been very similar. First they build a belt railway, which does little for rapid transit. Then they cross the circle or oval in various directions, by lines radiating from centre, and always following the lines of the crowded streets, which the first system did not do. Sometimes they build a smaller circle inside of the larger one, but always on the lines where people come and go. The more of these facilities that are given, the more the public demand, and the more they get. The original idea that there was a certain district of a city too sacred to be invaded by rapid transit lines, has now disappeared. It is found that this district is one to which people insist on being carried. There are but two ways of getting there. One is by a viaduct system, which is too costly for private capital alone, but which can be built if the community are willing to help. The advantages of riding above ground in the dear air of day need not be enlarged upon. The other system is to build subways below the surface. If it be attempted to keep very near the surface and dispense with elevators, the difficulties and cost are largely increased. But if the subways are placed below all pipes, sewers, and foundations, and are made of small size, then the construction becomes as economical as that of a viaduct above ground, but without requiring expensive right of way. This is the system that now seems to be in favor in European cities. The manner in which rapid transit facilities increase rapid transit is well illustrated by New York. Before 1834 the bulk of its population lived below Fourteenth Street, and all business was done below Canal Street. The invention of the horse-car in that year extended the area of population northward, while the ferry-boats built up Brooklyn and Jersey City. 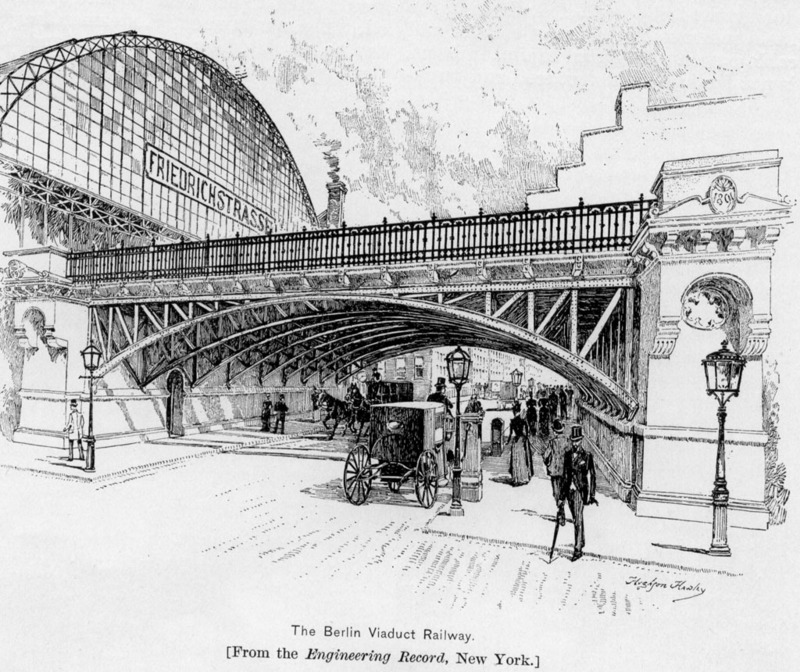 Surface lines were followed by elevated lines in 1878, and now the people cry loudly for more means of rapid transit. In other cities the number of yearly trips per inhabitant has increased greatly--in Chicago nearly as much as in New York, and in Boston more so. There must be added to the above number of passengers by the New York lines, about two hundred millions more who come and go by the ferries over the East and North Rivers, and the Brooklyn Bridge. This makes a yearly movement of 600,000,000, or a daily one of 1,643,000 persons, over one-half of whom come and go to the small area of New York island lying below Canal Street. The length of street-car lines in New York is 130 miles, and of elevated lines 90 miles, making 220 miles in all. It is not strange that more rapid transit lines and more bridges should be called for. A rapid transit commission has laid out lines that we shall refer to here-after. Boston jogged along for many years with slow, infrequent, and shabby horse-cars. The lines were owned by different corporations, and people could not change from the cars of one line to those of another without paying extra fare. This, naturally enough, did not encourage travel nor the growth of the city. But as neither streets nor cars were uncomfortably crowded, some wise men of Boston said: "Behold, how much better off we are than those wretched New Yorkers!" Eminent citizens went to the Statehouse and opposed the grant of more rapid transit facilities, on the ground that it was better and healthier to walk than to ride. They did not stop to consider that this would mean the increase of the crowded tenement system with all its horrors. But in an evil hour for the slow people, the seven different horse-car systems who had attempted to carry the people, were consolidated into one, called the West End Company." The first benefit was single fares. Then came more frequent cars. Then the electric system was introduced. At first it was attempted to run the car motors by wires placed in conduits. It was found that this led to all sorts of delays due to the loss of current from induction and grounding. The small boy became an important factor. He soon discovered that by dropping a forked wire into the slot after dark, which should straddle the conductor and touch the sides, he could short-circuit the current, and produce a most beautiful display of green sparks. This also had the effect of stopping every car on that division, which was still more delightful, and makes some of us wish that similar opportunities had been offered to us in our boyhood. The city authorities of Boston wisely gave permission to replace the conduits by overhead wires and trolleys - the "witches broom" of Dr. Holmes's poem. Since then all has gone well. The simplicity and economy of the system has allowed its extension into the outlying districts, until there are now 245 miles of single track, of which 81 miles is now electrically equipped, and all soon will be. This is the longest system of any American city except Philadelphia, which has 340 miles of single track. 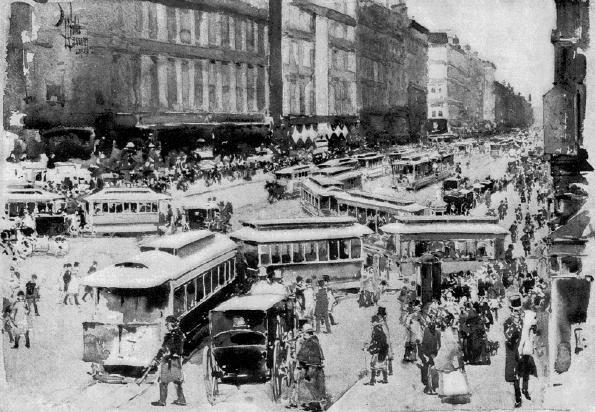 The number of passengers carried has increased from 92,000,000 in 1887, the year of consolidation, to 119,000,000 in 1891. The population has increased in the same time from 425,000 to 451,000. This gives the yearly number of rides per inhabitant, 263. There has been a movement of population from the inner to the outer wards, where, as will be seen by the map, there is a great deal of space yet unoccupied. The effect of this has been to replace crowded tenement-houses by business structures. The population of that larger Boston which lies just outside the city limits, added to that within these limits, is estimated at 800,000, or two-thirds that of Chicago. Half of these people come to town every morning and go out at night, 327,000 by street-cars, and 134,000 by steam railways, 461,000 in all. When we consider how small the business part of Boston is, and bow narrow and crooked her streets are, it is not strange that great congestion of traffic has taken place. All the lines crossing the city must pass through only three streets, and these become impassable during certain hours, and much time is lost. A commission was appointed last year to devise better means of rapid transit, whose recommendations we shall refer to later. The Crowd at Park Street Church, Boston. Drawn by Childe Hassam, engraved by W. B. Witte. Chicago finds herself to-day in the same trouble as the other cities we have mentioned. Her street lines cannot carry her people, and the soon-coming World's Fair will add many more to be carried. The city is prevented from extending eastward by the lake, and the congested business district is small in area, and cut off by the rivers from the outer districts on two sides. The steam railroads bring in many suburban passengers, but this does not give rapid transit. No steam railway can do it without separate tracks for the purpose, as it cannot run trains of cars often enough, and people will leave a steam line and use cable or electric cars, because there is no time-table to remember, and if they miss one car, they know another will soon follow. Also, there is too much time lost in going back and forward from the stations to their homes. This time is saved on the surface cars by their frequent stops. Horse-car lines have been used for many years, but the phenomenal growth of Chicago dates from the changing of these lines to cable lines, some six or seven years since. These cable lines are used as trunk lines on the great thoroughfares, and horse-car lines branch from them. When the horse-car reaches the main line it is coupled to the cable cars and the passengers go on without change. The lines are allowed to run trains of one grip-car and two trailers; each train can seat about seventy passengers. These trains run five or six miles per hour in the inner districts, but when they get out where the streets are less crowded, the speed is more than doubled. The excellence of this service has brought about the same trouble as we have found to exist elsewhere - a great and constantly increasing congestion of traffic. This may be understood from the illustration on page 568, showing one of the principal streets of Chicago crowded with cars at the end of the afternoon. It is stated that during the morning and evening hours there are not seats enough for more than half the people who ride. They stand inside of the cars and on the end platforms, and even hang upon the side platforms and steps, from which insecure places they often fall, and sometimes are run over. In addition to these dangers, street cars full of people are sometimes struck by the locomotives, which ran on the same grade as the streets, and tossed into the air as a bull would toss a baby-carriage on his horns. Various remedies have been proposed for this dangerous and uncomfortable state of affairs. The most obvious is to require all the trunk lines coming into Chicago to elevate their tracks, which will have to be done, notwithstanding its cost. Theorists say-pass a law forbidding passengers to be taken unless given seats. This would mean making half the people wait indefinitely, and public opinion would not tolerate it. Another suggestion is that conductors should be prohibited by law from taking fares except from seated passengers. Then the companies would put on more cars. But, say experts, to crowd more cars on the present cables would lead to greater delays in getting around the loops, and be a source of danger in passing through the tunnels. It is also found that if too many cars are run on one cable, and more than a certain number happen to start at once, the strain on the cable is too great and it breaks, causing peculiarly vexatious delays. The only real remedy is more lines, surface, elevated, or in subway. A rapid transit commission has investigated the whole subject and has made some very excellent suggestions, which, if adopted, will give temporary relief. These we shall refer to hereafter. The present surface lines are carrying 567,000 persons daily, the larger part to the congested district. During the World's Fair there will be a probable addition of 200,000 going each way. The present lines cannot carry them in addition to what they now carry. Relief must come from the steam railroads, and from steamboats running along the lakefront. The movement in street and subway cars of the general people in European cities, is much more sluggish than here. While in Boston each person makes 263 trips per year; in New York, 248; in Chicago, including the steam railways, 234; and even in Philadelphia, 160; we find that In Berlin there are but 104 trips yearly for each person; in Paris, including cabs, 130 yearly trips; and in London, 186 trips. The bulk of the people must walk, and to do this means living in a state of great crowding. The reason why they do it is, partly, that the lines are not located where people want to go, but chiefly on account of the system of charging separate fares increasing with the distance, and thus discriminating against the suburbs. In Great Britain, tramway-car fares are limited by law to a penny or two cents a mile, and this is charged, except when they come in competition with omnibuses, which carry passengers four or five miles for a penny. A penny a mile would mean ten cents from the City Hall in New York to Harlem, or twelve cents from the City Hall of Chicago to the World's Fair grounds. In Paris the omnibuses and tram-cars charge six cents for inside and three cents for outside passengers for distances under four miles. In Berlin the fares are less, which accounts for the greater movement of the people. They vary from two and a half cents for one mile to ten cents for six miles. The average distance traveled is 1.9 miles and the average fare is 1.6 cents per mile. The average distance traveled in Boston is 4.3 miles, and the average fare 1.2 cents per mile. In New York it is about the same. Averages are proverbially misleading. The real difference between the European and the American systems is that here a man can ride eight or ten miles, from the crowded part of the city where he earns his living to the open and rural districts, for five cents. In any European city it would cost him more than twice as much, actually, and if a working-man, more than that in relation to his yearly wages. The effect there has been to crowd people into the middle of a city. The effect here is to enable them to live in the fresh air of the suburban districts, where they sometimes have room even for a small garden. Certainly this is a result to be approved both by economists and philanthropists. The second effect of low single fares and quick transit is, as I have shown, to increase the population, and to increase the number of daily rides of each person, faster than capital has generally been able to supply the demand. Hence the complaints which seem to be universal in all large cities, where time is of value. In the second of these articles I propose to suggest some remedial measures, which will take a broader scope than if merely confined to matters within the province of civil engineering. A medieval city was a very picturesque object, with its narrow and winding streets and overhanging houses, and the tall cathedral towering above the market-place. As nobody rode, except here and there "an abbot on an ambling pad," or a noble lady on her palfrey, its area was small, and had to be kept small, so that people could get over it on foot. Hence the strong aversion which we find expressed in the literature and history of those times to the growth of cities. Even as late as in Charles II's days, Sir Christopher Wren, in making a new plan for London after its great fire, proposed to move all the graveyards and arrange them in a ring around the city, for the express purpose of preventing its enlargement. People dwelt in all parts of these cities, and carried on their trades, manufactures, and selling of goods under the same roofs where they ate and slept. There are persons still living who have heard it said that the proper place for a tradesman to live was over his shop. But with the changes caused by modern inventions the evolution of a city makes it more complex. Differentiation of parts takes place. One part becomes the financial centre; another, that of wholesale business; a third, that of manufactures; and a fourth, that of retail shops; while the residence quarters are farther and farther removed from the centre. These changes everyone must have noticed in almost all cities, but few have paused to consider that this evolution of the modern city comes from the extensive use now made of the sun's energy stored up in coal, and utilized through machinery in all the innumerable processes of manufacturing, industry, and transportation. Cities depend upon coal mines. They have grown with their growth, and prospered with their prosperity: and if ever the mines become exhausted, the cities will dwindle with their decay; unless we learn to transform the energy of the medium which surrounds us into power. We have shown that the growth of population and the habit of riding in cars have increased faster than capital has been able to supply the means of transit, from whence has come congestion of traffic in the larger cities, and from whence it will come in all. The evil has become serious, and is fast changing rapid transit back to slow transit. Various remedies have been suggested. Were it confined to one or two cities, we might hesitate to advise. But the same causes will produce similar effects in all of our cities, so that the matter becomes one of universal interest. The extension of cable and electric railways in cities like San Francisco, Denver, Kansas City, Buffalo, Minneapolis, St. Paul, etc., is covering rapidly with houses great areas of outlying territory, that were lately farms and pastures. As everybody wishes to go to the heart of the city, which is small, congestion of traffic must come sooner or later to all. The question is not one of invention and engineering alone, but it is interwoven with one of the most difficult problems of modem economic science-how far shall the community control and share in the burden of serving the community? We will take up this question farther on, and will now discuss some of the engineering features of an improved rapid transit. An inspection of the maps of cities, in this and the article in the May number, will show that the shape and contour of the town, as determined by the physical features of land and water, has much to do with the manner in which its rapid transit is developed. Thus, the steep hills of San Francisco were the cause of the invention of the cable system, which is also used in the steep streets of Kansas City. The long, level, and straight avenues of Chicago and New York, are also suitable to the cable system on account of their concentrated traffic and absence of curves. The crooked and narrow streets of Boston, with their frequent curving and intersections, are not suited for cables, but are worked very well by the electric system. Where there is a wide extent of sparsely settled territory, the electric trolley system is the most economical of all. The question is sometimes asked, what is the comparative cost of working street railways by horses, cables, or electric motors? The investigations of the last census throw light upon this, and I have collected some other statistics showing the cost of carrying a passenger, which is a resultant of the cost of running a car, and the number of people in that car. Table showing cost of operating Horse, Cable, Electric, Steam, Locomotive Lines, per Car Mile run. The lines should run from the business centre of the city in all directions to the suburbs, like the spokes of a wheel, so far as the physical features of land and water will admit. The lines should follow those streets which are already business thoroughfares. The system should be one upon which cars can move with equal speed in all parts of the city. No changes of cars should be necessary. The system should be a flexible one, capable of extension through the outlying and thinly settled districts without too much cost. The manner of carrying out this would be as follows: Beginning in the suburbs, we should have the present electric or cable surface railways; where there is not sufficient movement of ordinary vehicles to prevent a progress of nine to ten miles per hour, or even more. As soon as that part of the city is reached where a slower speed becomes necessary, the cars should ascend upon an elevated railway and run on it until either narrower streets, or any other reason, makes this kind of line objectionable. Then the line should descend from elevated to subway and pass under that part of the city where an elevated line would be inadmissible. After passing this the line may rise again to elevated and again descend to the street level. All these changes would not always be necessary. There is no reason why this cannot be done by either cable motors drawing trailing cars after them, or by cars each carrying its own electric motor. Not only do the smaller electric cars in Boston, but the great double-deck Pullman car, carrying thirty passengers below, thirty on deck, ascend six per cent. grades with ease. If it is desirable to run electric cars in trains, each should be supplied with its own motor, and all be connected and worked by one motorman at the end. It is true that the wheels of the old horse-cars, which have small flanges, would not allow them to run safely on an elevated structure. But safe wheels could easily be made, and as a matter of fact, the wheels of the double-deck Pullman street car are amply strong and safe enough. Let us see the application of this suggestion to practice. Take the city of Paris for example. 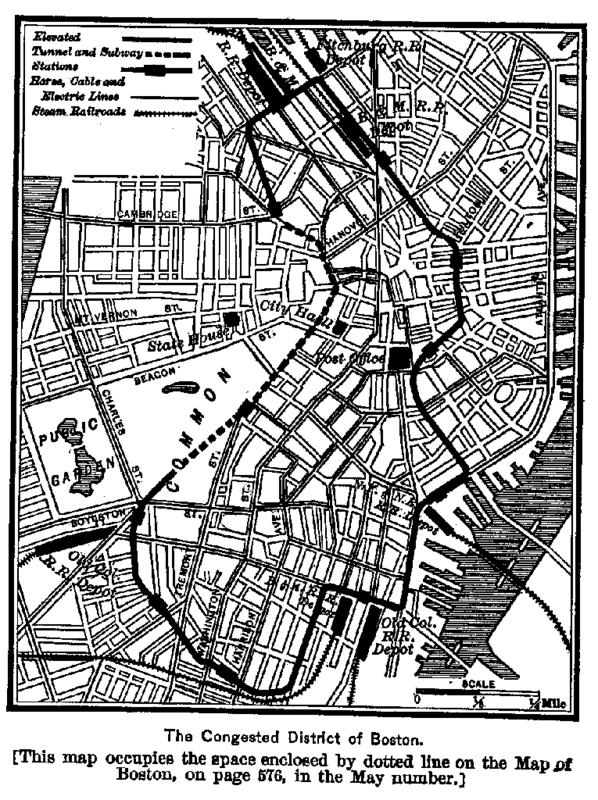 Here the Metropolitan Company projected by M. Eiffel does propose to ran partly underground and partly on the surface. There is no physical difficulty in their running also on elevated lines, if it is necessary. We have said that, owing to the small size of its business centre, the city of Boston is probably suffering more from congestion of traffic than any other American city. The method of rapid transit which we have just described is admirably adapted to give it relief. Through the broad suburban streets the electric cars now move at the rate of eight to ten miles an hour. The congestion of traffic extends for less than one mile, and is chiefly confined to two parallel streets, Washington and Tremont, through which the great tide of travel running north and south, and representing a population of 850,000 souls, passes all day long. The great shopping districts are about in the middle of this mile. 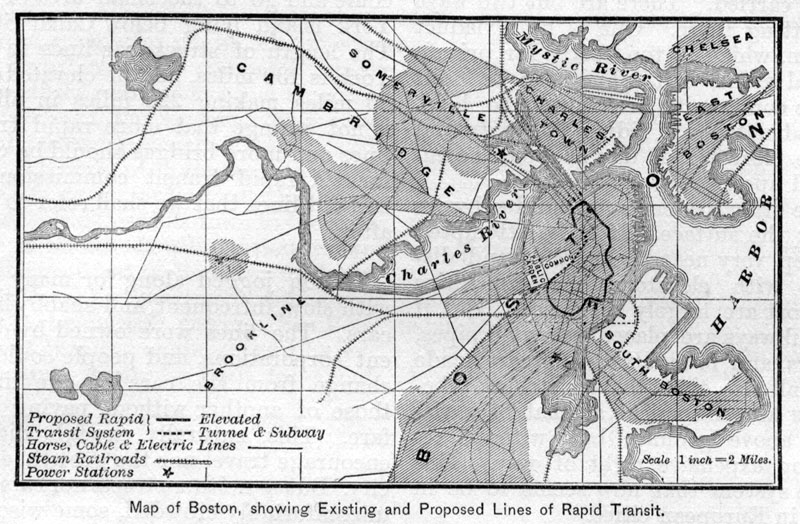 The West End Railway Co. finding that their cars take longer to pass over this mile than over three or four miles in the suburban districts, have asked the Rapid Transit Commission to recommend to the Legislature to allow them to construct a short subway running under the Common and a part of Tremont Street, and coming out at Adams Square. The nature of the ground admits of such a subway being connected with elevated lines at each end when desired. 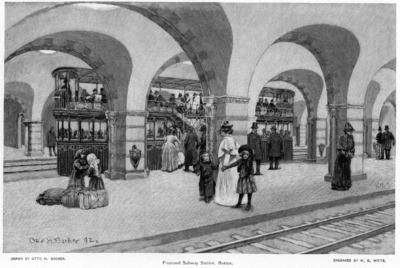 The subway would be similar to the short subway in New York under Fourth Avenue, between Thirty-fourth and Forty-Second Streets. It would be lighted at short intervals by openings in the roof, and would be unobjectionable in every respect. Near Park Street Church, where the great crowding shown in the illustration to the article in the May number now takes place, there would be a central underground station, where passengers could take trains to and from all parts of the city and suburbs. This seems to be a simple and reasonable way of relieving the difficulty, for the cars on the new subway would make so much better time than those on the surface of the streets, that the larger part of these would be withdrawn from the streets and take this route. The plan is one that can be quickly carried out, and at a comparatively small cost. The Commission, it is understood, will recommend this, but they go a great deal farther. They follow in the footsteps of Berlin, Paris, and London, and propose a circular or ring railway connecting all the steam railroad stations. Part of the line will be elevated, and it will descend under the Common and Tremont Street as the West End line proposes to do. This ring line will have no rail connection with either the steam railroads, or the street railways. Passengers are expected to change cars, ascend and ride around this circle. The experience of the European cities, to which I have referred in my former article, has shown that these ring railways, in consequence of their not following the lines of the principal thoroughfares where people want to go, and of trying to induce people to take a circuitous route where they do not wish to go, have been utter failures, and are now being supplemented by lines running across the circumscribed area in all directions, but always on the lines of main streets. It does not appear as if this Boston ring scheme would attract capital, as it would cost ten times as much as the other less pretentious plan, and people would not ride on it even free of charge, for they would have to pay another fare as soon as they left it, and no time would be saved. We have criticized this plan not in a hostile spirit, but present it as an object-lesson of what should be avoided. Of all difficult tasks, there is none more difficult than to make an American take the longest way around, when he can "cut across." The congestion of traffic, which makes the wide streets of Chicago almost impassable at certain times and places, comes from reasons which an inspection of the map on page 749 will clearly explain. The clear area shows the suburban districts; the lightly hatched area the built up part of the city; while the still darker lines show the business centre. It is separated from the north and west divisions by the rivers with their obstructive swing-bridges. This area is so small that land has become immensely valuable, and has caused the erection of those very tall buildings peculiar to Chicago. 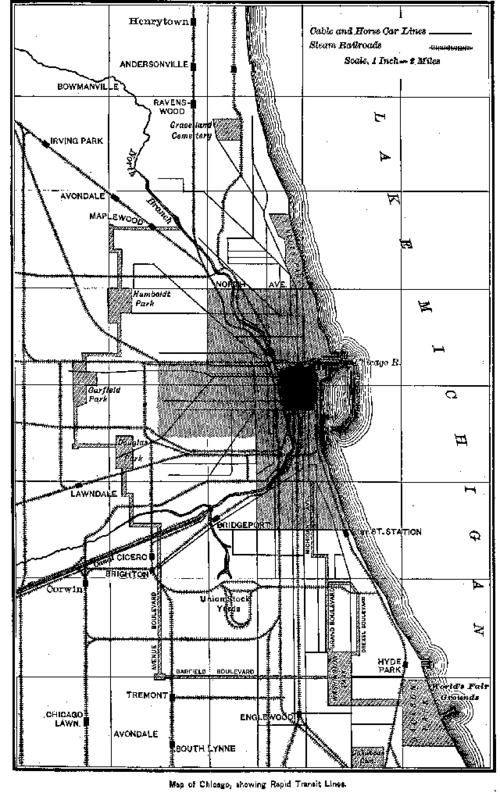 Map of Chicago, showing Rapid Transit Lines. The system which we have described adapts itself as if specially designed for Chicago. Run in on the surface as far as you can make speed, then run up upon elevated lines, and then run down under the streets of the small business area, crossing under the rivers by tunnels, limiting the subways to the shortest possible lengths. Then delays from bridges and from street traffic would cease, and the large damages consequent upon running through the streets of the business area would be avoided. The map of Chicago shows one thing peculiar to that town. In no other city that we know of are there so many steam railroads running so far into the heart of the city. The numerous grade crossings of these roads are a source of delay to them, and of danger to all. No matter what the cost may be, at some future time they will all have to be separated from the street level, and the only practicable way is to elevate the level of their rails. Their right of way is so valuable that within much of the area included by the encircling parks and boulevards, it would seem profitable to elevate the railways on structures rather than on embankments. This would give a second right of way under them, upon which electric cars could be run for local traffic passengers, interchanged with trains above, making fewer stops. The structures could carry the trolley wires necessary for supplying power to the surface electric cars. The surface lines would descend into subways which would connect all the railway stations together, cross under the rivers, and traverse the business centre in various directions. The map will show that such a plan as this, taken in connection with the present street lines and some new elevated lines, would satisfy the rapid transit requirements of Chicago for all time, and a no less comprehensive plan will do this. A new system of carrying passengers, called "the Multiple Speed Railway," has been invented in Chicago. One enemy of railroads is friction, and another momentum; or that stored up energy which makes trains unwilling either to stop or start. If they could be kept always moving and without stops, the motive power would be much less than now. It has been supposed (except by horse-car conductors) that it was necessary to stop a car to let passengers get on and off, but this plan does away with all that. Imagine a continuous line of platforms on wheels moved by electric motors at the rate of three miles an hour, at which speed persons can step on a moving platform from a station. Along side of this is another line of platforms moving six miles an hour. We step upon this. Beyond this are the cars, moving nine miles an hour, into which we step and take our seats. There being a continuous line of cars the whole length of the road, the carrying capacity of this system is enormous, being at least three times as great as that of the Brooklyn bridge cars. It is stated that this system will be used to carry passengers about the World's Fair grounds. The city of New York, as everybody knows, is surrounded by water and is long and narrow. This means a great concentration of traffic on parallel avenues and streets running north and south. From this peculiar shape, the walking distance was reached earlier than in other cities, and this led in New York to the earliest invention of horse-car lines. 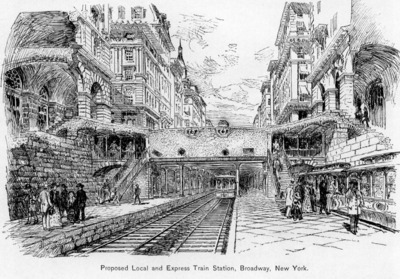 The same causes made New York the first city to build elevated railways, and these causes are now urging New York to undertake a still more costly system of rapid transit, either above or below ground. The official Commission on Rapid Transit has decided in favor of subway lines from the Battery to the Harlem River, and surface or elevated lines above the Harlem River, a distance of about ten miles. While street railways are unobjectionable, such a long one would not be popular in our climate. The questions of ventilation and motive power are not yet solved. Lines under ground have much less capacity than those in daylight, where trains can be run twenty to thirty seconds apart, which no sane man would dare to do in a tunnel. Mr. Depew, with equal wisdom and wit, has summed up the whole case. "Americans do not like to go under ground until they are dead." The Commissioners themselves say, that while they appreciate that a masonry viaduct would be the most desirable means of transit, they fear that it would be too costly, and take too long to acquire the right of way. The map on page 751 shows the location of the subways proposed by the Commission; with the exception of Madison Avenue, which is not suitable, the locations seem the best possible, following as they do the lines of the crowded streets. Section of Proposed New Street, Viaduct, and Warehouses, New York. Drawn by H.T. Schladermund. Let the city of New York open two new streets, one on the east, one on the west of Broadway, extending as near the southern point of the island as possible. The western street should run to the Boulevard at Fifty-Ninth Street. The eastern street to the New York Central line at Forty-Second Street. These streets should each be one hundred and fifty feet wide, of which seventy feet should be set aside for a stone and iron viaduct, sixty feet for a roadway on one side of it, and twenty feet for a sidewalk, as shown in the drawing. This viaduct could carry two express and two local trains, with platforms between at the stations; and the spaces which extend from one station to another should have extra tracks for turnouts, storage of cars, etc. The viaduct should be of solid masonry through the blocks, while the streets should be crossed by structures like those of Berlin. The viaduct foundations should be carried below the level of the streets, forming subways in which freight trains could ran. The viaduct would thus form a series of fireproof storage warehouses, artificially cooled if required. They would be all connected by rail with the New York Central and other railways. The rental of such storehouses would return four per cent. on the cost over and above taxation and repairs of their construction. The city should lease this seventy feet, which is needed for the viaduct, to a private company who would build it and operate the road under proper conditions. The city would gain two new wide avenues, running north and south, for wheel traffic, which would relieve the congested condition of Broadway and other streets; and, as all will admit, are much needed. It would also gain an ideally perfect system of rapid transit. 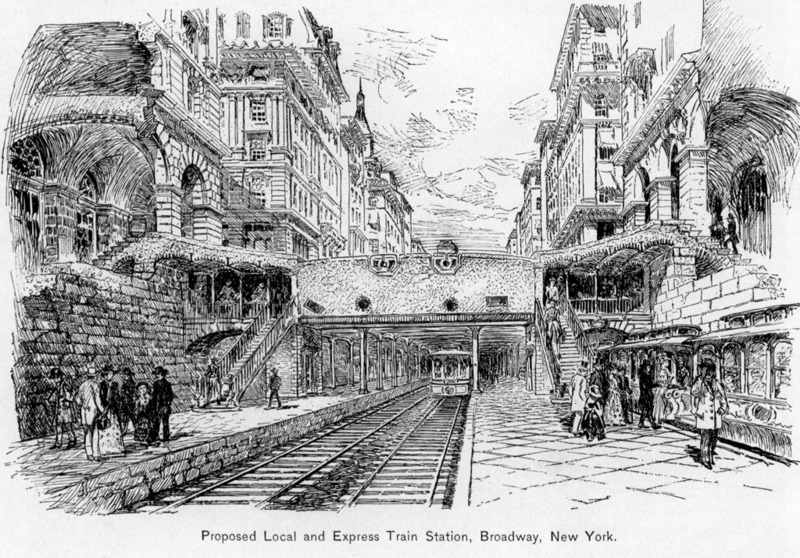 Proposed Local and Express Train Station, Broadway, New York. Above Fifty-ninth Street very much less expensive elevated lines could be run in the centre of the Boulevard. Above Forty-second Street, on the East Side, it has been suggested to run over the centre of Park Avenue, which is one hundred and forty feet wide. This would allow of making openings in the New York Central tunnel below, which would improve it very much. As any comprehensive scheme of rapid transit for New York would require a long time to carry out, present relief can be best obtained by giving greater facilities to the elevated lines. Instead of being prevented from laying third tracks and acquiring better terminals, they should be encouraged, so far as it can be done without cost to the city. The completion of a third track on the Eighth and Ninth Avenue lines, upon which express trains with few stops are run, has reduced the time from the Harlem River to South Ferry from fifty-two to twenty-five minutes. If the East Side lines could ran similar express trains the public would be greatly benefited. 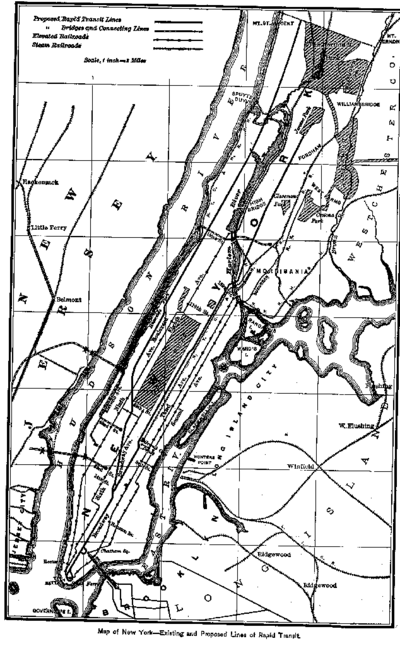 Map of New York--Existing and Proposed Lines of Rapid Transit. New York was built up by commerce, borne in ships and canal boats on the water, and she is connected with the railway system of the country by only one line, a very great one, it is true. Passengers and freight we know are transferred from the trunk lines which end in New Jersey by ferry-boats and barges. No better way of handling freight can be devised, as the barge with its load of eight or ten cars can be towed to wharves at any part of New York or Brooklyn, just as the canal-boats that come down the North River are towed. Ferry-boats were invented for the harbor of New York by Colonel John Stevens, not long after Fulton's successful trips by steam on the Hudson River, and are admirably adapted to their purpose. The design has been imitated all over the world. There are few better designed craft than one of the modern steel ferry-boats with twin screws at each end, and double deck accommodations. The great crowds of foot-passengers and teams that come and go to and from the lower part of New York cannot be better served than by these ferry-boats. But the through passengers who arrive at Jersey City and Hoboken by train require a better mode of crossing the river. A bridge upon which trains could run into the heart of New York would be a great convenience and saving of time, especially when the ferry-boats are detained by fogs or ice. 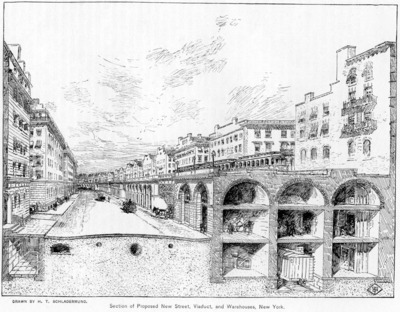 The success of the Brooklyn Bridge has been so great that it is proposed to build three or four new bridges over the East River; two at the lower end of the town to connect the elevated railway systems of New York and Brooklyn; and two above Forty-second Street for steam railroads only. The New York & New Jersey Bridge Company propose to cross the North River at Seventy-first Street and connect with ten railroads that now stop at the right bank of the river. This bridge will be connected by a steel viaduct with a great union station at Forty-second Street and Broadway. Another line will give connections with the New England railroads. The grades will be easy, averaging forty feet per mile. It is intended to have a large hotel at the station, so that passengers can reach their rooms without leaving the building. Besides this bridge, there are numerous tunnels projected under both rivers, and one is partly built. Of these tunnel projects, it may be said that the difficulties of making approaches to them and connections with railway lines are very great. Their capacity also is very much less than that of a bridge, and they are not looked on with favor by capitalists. Mr. Henry M. Whitney, President of the West End Railway Co., of Boston, in his admirable argument before the Committees on Cities and Taxation of the Massachusetts Legislature, contrasts the European systems of increasing the fares according to distance traveled, with the American system of one fare for all distances. The American street lines lose money on their long-distance passengers, but more than make it up on their short-distance passengers. The tramway fare in Berlin is 2.5 cents, or 10 pfennigs, for each 1.5 miles. When you go beyond the line you have to you have to pay two fares, and so on, so that to ride six miles would cost 10 cents. By the American system, which discriminates in favor of the suburbs, a man can ride ten miles or more to his home for 5 cents. Also, as Mr. Whitney well shows, the increase of speed due to the electric system, shortens each trip ten to twenty minutes. "While you are legislating under this roof," he says, "to reduce the hours of labor, this transportation company, by simply changing its system, has reduced the hours of labor nearly half an hour per day." The effect of the other system, where the suburbs are discriminated against, may be seen in the crowded state of the houses in Berlin. In 1885 there were but 2,820 private houses, and 900,000 out of 1,122,000 persons lived in tenements; 478,000 of whom lived in one room that could be heated, 302,000 in tenements of two rooms, and 101,000 in cellar or underground tenements. Contrasting this with Somerville, a suburb of Boston, containing about forty thousand persons, Mr. Whitney shows that there are 7,000 houses, making the number of persons to a house 5.9, which is about the same number as is found in the rural districts of our well-settled States. That is to say, people can live in a comfortable town only five miles, or half an hour's time, from Boston, paying ten cents a day to go there and return, and be no more crowded in their dwellings than are people who live in the country. Is it any wonder that our cities and their suburbs grow at the expense of the rural districts? How fast they grow has been shown by the United States Commissioner of Labor, C. D. Wright, in an article in the Popular Science Monthly. 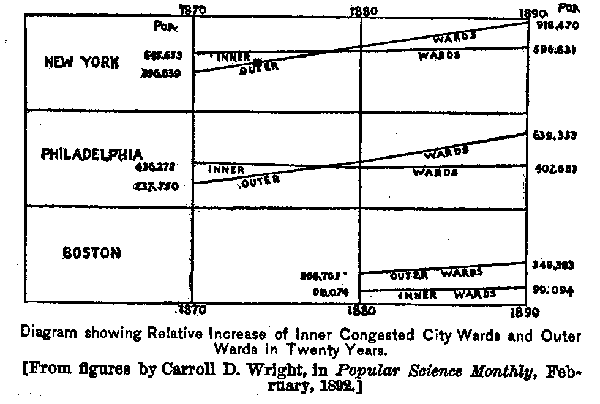 I have translated his columns of figures into a diagram [p. 752], which shows the increase of population in New York, Philadelphia, and Boston, in the inner, congested wards and in the suburban wards, during the thirty years in which street railways have been in use. Other observations show that the rate of increase in the suburbs of London, over that of the older, congested parts of that city, is equally great. "Outer London is beginning to vie in population with the 'inner ring.' In a few decades hence it will have passed it." The English writer goes on to say: "If the process goes on unchecked, the Englishman of the future will be a suburb-dweller, and the suburban type will be the most wide-spread and characteristic of all, as the rural has been in the past, and the urban may be said to be in the present." The same thing may be said of this country by those who see the great ex tent of suburban area that has been annexed to all our cities since the introduction of the electric trolley system. While it is true that, without the skill and ingenuity of inventors and engineers the rapid transit of to-day would not be possible, yet it is also true that, unless the relation between these systems and the community is fixed upon a proper and just basis, trouble will always come, and neither the public nor investors will be satisfied. Our present systems have grown up in a hap-hazard sort of way. Certain astute persons have procured from State legislatures charters for street or elevated lines, granting all the privileges that could be thought of and imposing very few obligations. All that the city, whose streets were taken, could do was to try and get as much money as possible out of these companies by taxation. If it succeeded, the company took it out of the public by diminished service. As the Legislature commanded the situation, the companies were obliged to retain lobbyists to protect their interests. The effect of all this has been that the ownership and control of street lines has fallen into the hands of persons eminent rather as politicians than as capitalists. The number of animals has diminished during the last year 26,181, showing the rapid increase of the use of electric and cable power. The total capital invested is not far from nine hundred and twenty millions of dollars. This shows the great importance of a proper regulation of those important properties. There are but two ways in which public service can be performed- either directly by the paid servants of the public, or indirectly through chartered companies. In our country, public opinion has decided in favor of the latter. Until our cities are managed on business principles and run by experts, few would wish to see their powers extend ed. The management of steam railways can be regulated by competition, and all that government should do is to see that safety is provided for, and that all are treated fairly and alike. Competition cannot be applied to street railways except in the beginning, for when all the avenues of access to the heart of a city are occupied, no new lines can be built, and those who first get possession have a monopoly of surface travel. Charters may be given to elevated lines and to subways, but combination may take place and the monopoly then becomes absolute. This is the justification for the exercise by the community of regulation and even interference with the management of street railways. The community, however, should not only be just but generous in its dealings with the companies, and share with them the burden of rapid transit by furnishing the place to put the lines, either on the surface, or above, or below ground. That is to say, the city should condemn the damages caused by any of these forms of rapid transit, pay the abutting property owners before they are built; and charge the companies a rental for the same based upon the rate at which the city can borrow money, as we have suggested in the case of the proposed new viaduct streets for New York. To run cars as often as the public service demands, and extend their lines when the public service demands. In case of disagreement the matter should be settled by arbitration. To charge uniform fares for all distances, and but one single fare, all over the city or town limits. Even where there are many companies, interchanges should be free. To run at agreed-on rates of speed, maintain clean and well-lighted cars, properly heated in winter, and having all modern improvements. To use that form of rail which interferes least with ordinary traffic, and to keep the pavements clean and in order between the outer lines of rails. To pay an annual rental for the right of way. In return for the proper performance of these duties the community should give the companies the place to put their tracks. In case of strikes they should have the full protection of the military and police, as if they were public servants. Conductors should be special constables authorized to arrest drunken or disorderly persons. In running cars they should have the right of way, and other vehicles should not be allowed to detain the cars and their passengers. Finally, after paying their rental they should be exempt from all taxation, except on real estate owned by them. In lieu of taxation the payment to the community should be by lowering fares. The accounts of the companies should be subject to the inspection of public officers, and when the net earnings during a certain number of years should be found to exceed ten per cent. on the capital invested, a lowering of fares should take place. In case of dispute, the matter should be settled by arbitration. It may be said that fares can only be lowered a cent at a time, and that this is too much. But there is nothing to prevent the sale of tickets in bunches of twenty-five, at any fraction of a cent discount. All these stipulations should be embodied in contracts between the cities and the companies, which should be perpetual, except in case of forfeiture by the company for neglect or non-performance of duties. All the mutual stipulations the courts should enforce. It seems to the writer that such an arrangement would place the operating of rapid transit lines in the same position as if it were done by the public directly, except that the payment to the company would be a possibility of a ten per cent. dividend to be earned by business ability, instead of payment by fixed salaries. It is a great mistake to tax transportation in any shape, for all experience has shown that the tax comes out of the public in the end, from economies which result in inefficient service. The higher the tax the company pays, the less it does for the public in other ways. Also, high taxes upon corporations are direct incentives to public extravagance. On the other hand, the lowering of fares is a positive gain in every way. When the fares on the New York elevated lines were reduced from five cents during four hours and ten cents during the rest of the day, to an uniform fare of five cents all day, the increase of travel more than repaid the Manhattan Company. The saving to the community during five years has amounted to 1.36 cents on 890,824,786 fares, or a total of $12,107,600. If the city of New York bad taken this sum in taxes, what would it be now? There is no reason why, when new franchises are to be granted, that the city should give away a safe ten per cent. investment. A rental should be fixed, based upon the cost of condemnation of damages for right of way, and the franchise should then be sold to those who would bid the highest sum for it, after agreeing to pay the rental and be bound to perform the duties we have described. The maximum allowable dividends are purposely placed high, so as to induce the companies to adopt improvements and attract custom, as private individuals do in their business. If they were restricted to a small dividend, they would not be induced to improve their service and change from horse to cable or electric motors. Under some such mutual arrangement as we have suggested, made definite and lasting, not only would street railway investments be safer and more attractive, but the complaints of slow and dirty cars and no seats would quickly disappear. The population of our cities is increasing in a greater ratio than that of the country at large. This increase is caused by the increase of industrial occupations which can best be done in a city. The growth is mainly a suburban growth, and the places once occupied by crowded tenements are being taken for purposes of business and manufacture. The steam railways can supply food and access to a city of any size. The growth of cities will never stop as long as these conditions last. The only question is, how to get in and out from the suburbs where people live, to the heart of the cities where they work and trade. The solution is found in such methods of rapid transit as we have attempted to describe, or in other better ones yet to be invented. What shall be the relations between the community and its servants, the chartered companies, is one of the most important questions of the day. Henry George, in his letter to His Holiness, Pope Leo XIII., says: "There is a natural law by which, as society advances, the one thing that increases in value is land- all growth of population, all advance of the arts, all general improvements of whatever kind add to a fund." So far we all agree with him. But this is his conclusion: "Add to a fund that both the commands of justice and the dictates of expediency prompt us to take for the common uses of society." No! Mr. George. So long as a poor man can buy an acre of land within an hour's ride of that city where he finds constant work, and can buy everything he wants at the best rates, and do all that for ten cents a day-he will never allow Henry George to tax his little home out of existence for the good of an imaginary creature of the brain called Society. And this increase of health and comfort to the people, this strengthening of the bonds of the commonwealth, this barrier against anarchy, has all been brought about by the humble invention of "paving the roads with iron bars." Thus doth God work His changes upon this earth. Proposed Subway Station, Boston. Drawn by Otto H. Dacher, engraved by W. B. Witte.